Since 1987, CNB has been building yachts ranging from 18 to 60 metres using both aluminium and high-tech composite. Having delivered over one hundred boats to experienced sailors and to those who appreciate true elegance, CNB has acquired unparalleled experience in meeting the highest technological standards. Their expertise has also gained widespread recognition in the form of numerous prestigious international awards. The Philippe Briand semi-custom CNB line starts with the Bordeaux 60. 50 of these yachts, measuring over 18 meters in length, currently sail the world’s oceans. 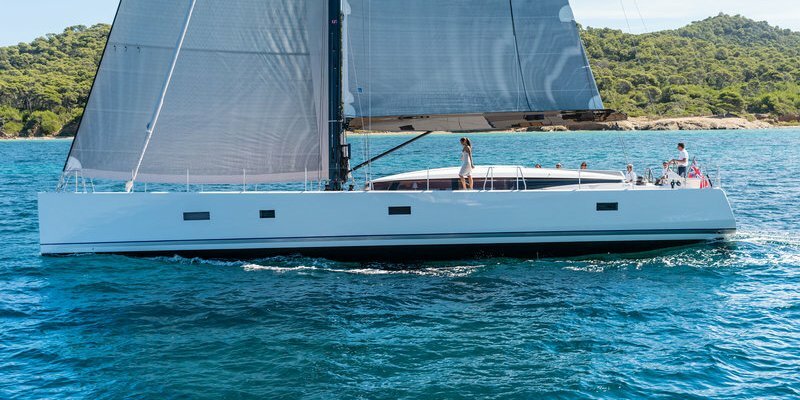 The merits of this yacht’s design have long been proven, incorporating an expertise that shows both in the construction itself and in its beautiful styling. The CNB 66, the latest addition to the line, stays true to what defines CNB’s essence: quality, elegance and performance. Conceived as the largest in its class that can be sailed without a crew, this 20-meter family yacht adopts the sleek modern profile of the CNB 76 while retaining the convivial warmth of the Bordeaux 60. Jean-Marc Piaton and Rafaël Bonet have created an open and bright interior space on board, incorporating both classical and modern elements. Entrusted to the very capable hands of the same interior designers, the CNB 76 does nothing less than revolutionise the passengers’ relationship with their space and with the sea. The independent crew section is a particularly strong feature which has already attracted 21 owners now sailing around the globe. Philippe Briand has exercised his full design prowess to create a yacht of strikingly balanced and refined proportions.